What is an experience worth? Like the long-lasting memories that come from them, the experiences of travel are what make it priceless and unique. 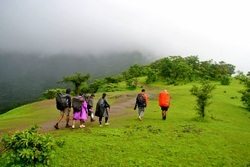 An experiential travel journey is one that moves you and your team, one that connects you and your team with the local environment, local people and the culture of a place such that it enriches you and changes you; and has a positive impact on how you perceive your environment and interact with your team even after you have returned back. Come dwell into the journey of curiosity and face the encounters that bring a smile to your heart and affect you and you team profoundly to enrich life and its bonds immeasurably . We conduct experiential and meaningful travel for groups with a facilitator on a learning journey that is different, fascinating and enriching. All our experiential travel journeys are to off beat and remote locations including visiting pristine and undisturbed natural areas. We conduct Responsible experiential Journeys and care about the environment and aim to reduce the negative ecological impactgenerated. We embrace sustainable travel and incorporate eco-friendly practices throughout our events and trips. Contact us to customize a learning journey for your team.